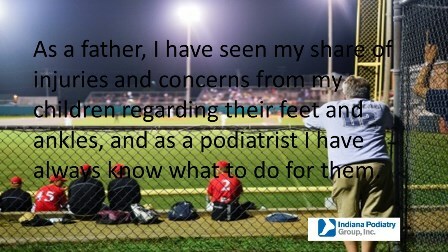 As a father, I have seen my share of injuries and concerns from my children regarding their feet and ankles, and as a podiatrist I have always know what to do for them. Not everyone has that advantage, unfortunately. It is common for those without medical training to be unsure of how to proceed when their child hurts their feet. Some injuries may seem serious but have simple treatment plans, while other issues may seem trivial but turn out to be quite serious. Parents in my office are often concerned about whether they are doing the right thing when it comes to their child’s feet. Over the next several posts, I would like to present several common foot and ankle issues children find themselves developing, and advice on what can be done to identify these conditions and when to seek treatment.